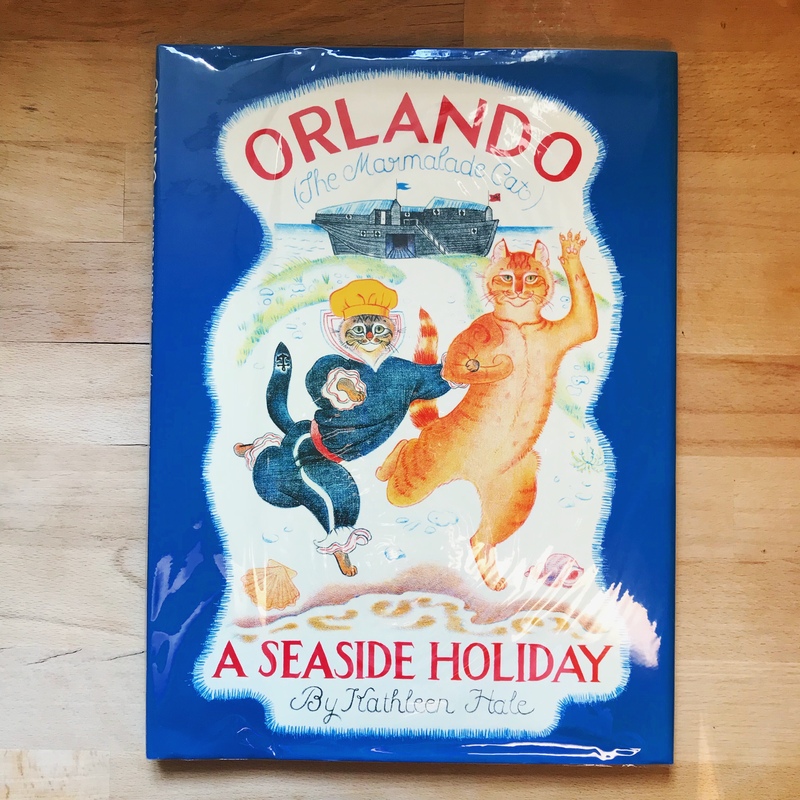 This month’s I picked Orland the Marmalade Cat: A Seaside Holiday by Kathleen Hale (Frederick Warne 1991). This is a perfect book to read when you are craving to get out the city to a nice countryside or a seaside town. I saw Orland when I was Googling ‘marmalade cat’. I instantly fell in love with the old-fashion yet charming illustration of the orange cat. It was from one of the Orland the Marmalade Cat picture book series which made its debut in 1938. Luckily, I found a copy of 1991 revised edition of A Seaside Holiday (the original was first published 1952) in Foyle’s. The story opens with an illustration of Orland, his dear wife Grace and their three kittens dying on the staircases in the hot summer weather. They have quite lost their appetite. The kittens don’t even eat their treat of shrimps! Orland wants to take his family on a summer holiday, but he is very disappointed to find that all the hotels and boardinghouses are full up. Then his friend Vulcan the horse saves the day by suggesting a trip to a seaside town where there’s a huge old beached ship converted B&B. It turns out to be the holiday of a lifetime. They swim, sunbathe, go flying on the tail of a kite, encounter with a mermaid, and even help to rescue shipwrecked travellers. The story is packed with messages still relevant to today – youngest child syndrome, old age loneliness, and immigration. But the best feature of the book is definitely Kathleen Hale’s delightful illustrations. Her colour pencil illustrations are full of interesting and often surreal details and visual humour and tenderness. My favourite character is Grace. She is such a lady who is kind and delicate but can be very persuasive when she needs to be! Look my cat Clementine dying this heat. I think she needs a seaside holiday too.